Manufacturer and Exporter of Industrial Machinery and Equipments. •Double cutters for making bottom and T-shirt bags. •CB2P is equipped with four feeding devices to produce four lines non-printed bags, CB3P is equipped with six feeding devices to produce six lines non-printed bags. •Equipped with four feeding devices to produce four lines non-printed bags. 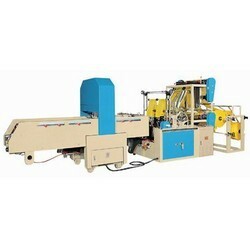 •Punch press in-line to automatically produce T-shirt bags. •Equipped with conveyor & heat needle devices. •Servo motor is an option. •The machine will stop automatic when there is no film, stuck film & lower temperature. •Servo motor & photocell are options. •We didn't show all specification & model, please kindly contact us for other model & details specification. Bag length 30" 30" 30" 30" 30"
* Output depending on bag width, length, thickness & raw material. * For more details specification, special requirements & quotation, please kindly contact us.